In which we take a look at Sotherton Backler’s apprenticeship to Daniel Hanchett, Apothecary of London, and look at the neighbourhood where they lived. We note Sotherton’s marriage and the births (and, sadly, deaths) of their many children. In her History of the Worshipful Society of Apothecaries (1998, p 194), Penelope Hunting notes that ‘the rising status of apothecaries has been traced to the recruitment in the early 18th century of a ‘high proportion of apprentices who were sons of clergymen’. There was a high value placed at that time on obtaining a good apprenticeship and ensuring a secure trade for such a younger son. Sotherton was apprenticed to Apothecary Daniel Hanchett in 1721 and was made ‘free’ of the Society of Apothecaries in 1732. His apprenticeship would have been served at Hanchett’s premises in Coleman Street, which runs north to south just east of the Guildhall. Once the apprenticeship was completed, Sotherton’s address was at nearby Fore Street from 1738-1756. Apprentices needed to be proficient in general knowledge and Latin, and Sotherton would have had practical training in pharmaceutical skills, alongside attending lectures and classes, anatomical dissections, home visits and instruction in botany and chemistry. 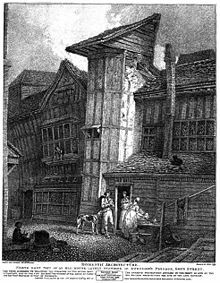 The image above of Sweedon’s Alley, Grub Street is from around 1777, and perhaps illustrates the environment in which Sotherton lived earlier in the century. Apothecaries of the time had a mixed reputation. A contemporary document referred to ‘the mere apothecary – a Creature that requires very little Brains’. Many people were suspicious of the apothecary-doctor, whose potions might poison as much as cure. The lack of understanding of illness and disease at the time meant the use of traditional herbal (galenical) and other remedies (for instance mercury for venereal disease), which could do as much (or more) harm as good. Yet the public sought out apothecaries, often because most people could not afford the expense of the university-educated doctor. Sotherton’s marriage to Ann Ashley in 1732 resulted in the birth of 9 children, but the parish records of St Giles Cripplegate show that they were mostly short-lived. How sad it must have been for the apothecary father to be unable to avert the deaths of his children from ‘rising lights’ (any obstructive condition of the larynx or trachea (windpipe), characterised by a hoarse, barking cough and difficult breathing, occurring chiefly in infants and children); small pox; consumption; ‘tooth’; and measles. Of the nine children born, only two (Ann and the second Sotherton) and perhaps a third (Elizabeth) survived into adulthood. http://www.motco.com/index-london/SeriesSearchPlatesFulla.asp?mode=query&title=Grub+Street&keyword=1820&x=11&y=11 From Smith’s Ancient Topography of London, 1815, said to be drawn around 1791, the building taken down in 1805. Cited in Penelope J. Corfield. From Poison Peddlers to Civic Worthies: the reputation of the apothecaries in Georgian England. Social History of Medicine22 (2009), pp 1-21. The quote is taken from: R. Campbell. The London Tradesman: Being a Compendious View of all the trades, professions, arts. London, 1747. My first blog about the Backlers – ‘Samuel Backler, Vicar of Ashwell, Herts’ – set out my knowledge to date about my 6x great grandfather, Samuel Backler. This blog describes how I discovered his identity, and also that of four of his descendants – all apothecaries ‘of Apothecaries Hall’. Ever since my mother and I had found some precious marriage certificates at the old family history centre in London’s St Catherine House, I had known that my 3x great grandfather was Samuel Backler, who in 1810 had married Mary Pellatt, daughter of the famous glassmaker Apsley Pellatt. Searches on the surname ‘Backler’ in The Times of London at around that date showed that, in advertising his wares, Samuel described himself as being ‘of Apothecaries Hall’, with cures and treatments available from his elaboratory in Bedford Street, Covent Garden. I knew nothing about apothecaries, nor about City Livery companies. I had a treat in store. 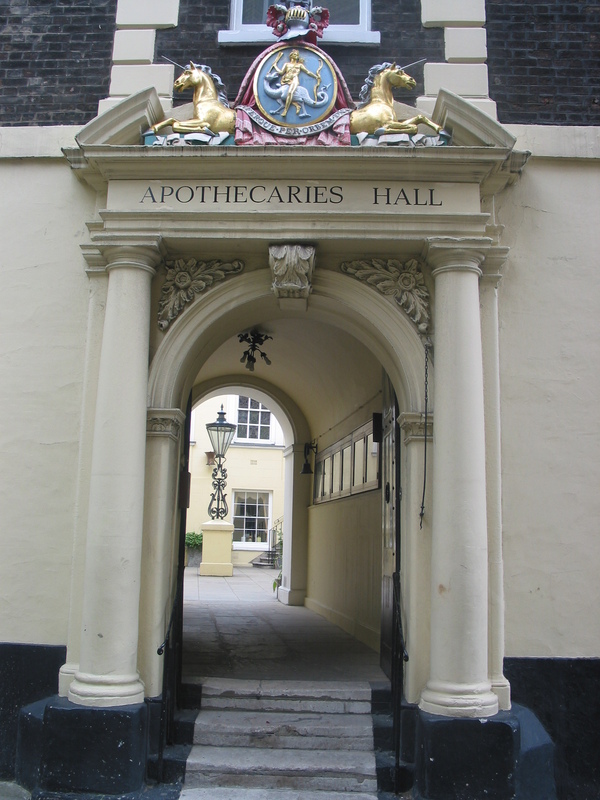 My first visit to Apothecaries Hall was like stumbling into an ancestral (and historical) wonderland. There was information about four Backlers, from the so-called ‘Cecil Wall cards’, so named after the Clerk to the Society who sometime in the early 20th century indexed references to the Society’s members from documents such as Court Minutes, apprentice registers and much more. Sotherton senior’s card took me back two generations from Samuel, and provided invaluable information in several respects. The card showed that the first Sotherton (1704 -1763) was the son of the Rev. Samuel Backler, of Ashwell, Herts and that Sotherton was apprenticed to Apothecary Daniel Hanchett in 1721. Sotherton was made ‘free’ of the Society of Apothecaries in 1732, was elected Beadle in 1757, and died in 1763. His wife Ann (nee Ashley) had become Butler on his appointment as Beadle, and she continued in this role – and was also a Society pensioner – until her death in December 1768. The Beadle’s son, also Sotherton, had become deputy Clerk in 1802 and was Clerk from 1806-1816, when, according to the notes, ‘the Society presented him with a piece of plate on his resignation, value 50 gns’. He attended the bicentenary dinner in 1817 as the Navy Accountant, and was elected Secretary to the Friendly Medical Society which post he held from 1799-1816. The second Sotherton’s son Samuel (1784-1870) had been apprenticed in 1800 to Thomas Hall, but on his Master’s death, Samuel was released from his indentures and in 1805 gained the freedom of the Society by Patrimony. The records show that he was in the service of the Laboratory Stock, established many years previously to oversee and control the quality of the manufacture of chemical and plant-based medicines. In 1843, he withdrew from the Society – I suspect due to his waning fortunes, which had included bankruptcy as a tobacconist in 1831. These three men were my 5x, 4x, and 3x great grandfathers. But there was a fourth Backler – John Backler (c. 1780-1846), the second Sotherton’s son by his first marriage (and therefore Samuel’s half brother). John had been apprenticed to his father Sotherton, and further research through other sources showed that he had a troubled career, shortly after his father’s death in 1819 having to go to Paris to avoid court proceedings over his business dealings. Armed with this information, I could investigate further the lives and careers of these four apothecaries – a topic about which I knew very little! In my next blog I will look at the life and times of the first Sotherton Backler, and explore just what was meant in his role as ‘Beadle’ to the Society. After that I will look at the second (surviving) Sotherton who became first, Deputy Clerk, and then Clerk, from 1806-1816, and his involvement with arrangements for the Society’s participation in Admiral Lord Nelson’s funeral procession on the River Thames in 1806. Further ahead, I will look at a trade issue arising in correspondence by the Society with the Army Medical Board in 1810-1811, concerning, among other matters, the quality of Peruvian Bark (or Jesuits’ Bark, or cinchona), and the coincidence of timing with the trade of the afore-mentioned Samuel Backler, my 3x great grandfather. In all of these blogs I will also describe what I know of these men’s families, finishing my stories of the Backlers with a look at the career of the 19th century cleric, Sotherton Backler, and that of his half brother, John Backler, apothecary.